View Poll Results: Which starters will you choose? January 28th, 2018 (11:10 AM). Edited 5 Days Ago by IRON NIDOW. - The game focus on a more mature audience. The narrative focus on man vs nature/man/gods dilema. - Titanic Creatures that ocupy the whole screen! This is how things work here! Essentures are creatures made by Essence, the constituent unit of matter in Essentures Universe. Humans believe in a kind of Creator, an entity said to had create everything, and Essentures are a kind of gift created for Humans from this legendary Creator. A millenarian culture of fighting side-by-side has been built among Humans and Essentures, enjoying together the same bliss and glory of victory or sharing the same hurts and pain of defeat. "A true warrior picks up their sword and fight alongside their fellows Essentures until the end" This is the motto of Essenture’s world. You’ll play the story of a young son of farmers that has just discovered having the power to open the Emperor Celestial Door, an old tale of a warrior said to have unified all the world and reached his end by opening a door in the sky that could leads to Heaven. You will face a journey across 5 Kingdoms discovering the mysteries of the Seven Ancient Wonders, while you discover your own story and bringing back a past never knew by humanity! A journey that will lead you to face many opponents, wars and even gods! However on your way you'll find many true, loyal, and powerful allies! While exploring and fighting wild creatures, you'll take the perspective of zelda-like games, this means in those ocasions the game is action-RPG. Important Battles like Bosses, and battles agaisnt other humans are RPG turn-based. The battles also has a unique mechanic that involves zero-luck, theres no 'attack missed' or 'critical hits', however there's a lot of mind games and strategy build. If you find a Wild Essenture or a Bandit while traveling, don't think they will ask you in a polite way to fight and accept nicely your refuse, in fact they won't even care in attacking you directly without say any word, and be sure they won't even mind in attacking you from behind!! This means you'll need to be prepared to fight together with your Essentures. Human Warriors must possess the Gauntlet of Essences, a powerful artifact that lets you absorb Essentures Powers to create powerful Weapons and Allies; this is the only way of having a chance to not become easily Essenture food in a surprise attack! 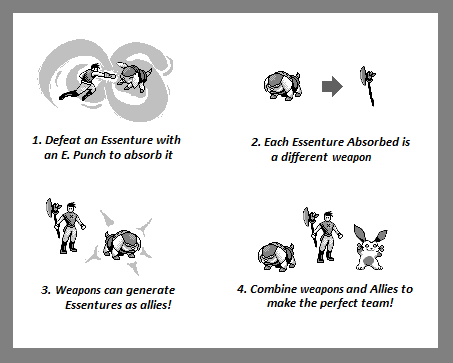 Each Essenture Family has a unique physical attack, when you absorb it, you earn a weapon that has the properties of that physical attack, you can equip one weapon at time. There’s many weapons to collect, one for each family! Use them to make some wonderful strategies! 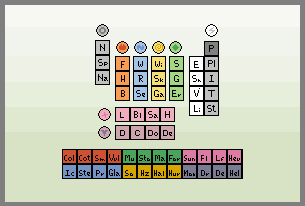 A game with its own periodic table, can you guess all the elements? This game has its own periodic table based on the real chemistry periodic table, but simpler. There’s 8 Essences: Red,Blue,Yellow and Green Essences that is part of the "nature forces essences" making fire, water, wind and soil elements; The Pink and Purple Essences that are part of the "Will essences" making Light(good) and Dark(evil) Elements; the White Essence, that makes the Electro Element, the purest Essence; and the Gray Essence, that is necessary to put Essences together and form elements, also it alone makes the physical force. If you have a mind on science imagine Essences as somehing like neutron,eletron,proton and Elements as Chemical elements. However with some differences. Also each creature has a 'main' element or type, this main element can be used with a comand called 'Esshant' that will combine its physical move with the element giving devasting effects. 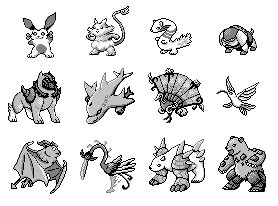 There are 4 starters and you can pick 2! Battling alone is not a wise decision; Essentures are the most loyal partners you can have. At the start of your journey, you can pick 2 partners! Its tail is shaped like a clover. Said to be the luckiest creature in the world. 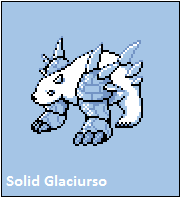 Its main fighting style is abusing its high speed in different techniques. Its element is Earth. 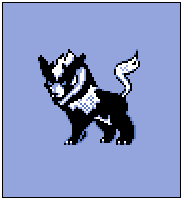 Bearer of Physical Power, This is a loyal creature with a good attack and defense, it fights using it’s ears like horns doing a bull-like charge while raising its power temperature to burn opponents in one strike. Its element is Fire. looks like a calm creature, but it has a vicious nature, it’s a predator despite its small size. It has a wide pool of special techniques. It’s element is Water. 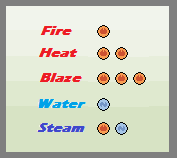 Each Essenture represent one of 4 elements, 4 battle styles, and each has 4 Evolutions! Yeah! 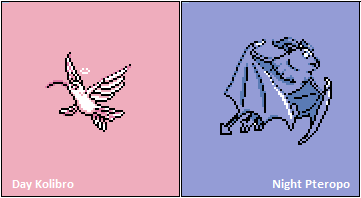 Let’s see bellow how evolution works in this game. 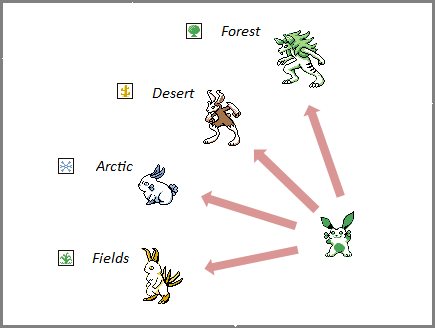 Evolution is completly reversible and optional, also you can keep evolving among species already evolved, this is particularly useful because each species is focused in a pool of elements(Essence types), and you can maintain their Essences after evolving, increasing even more your range of Essence types and strategies. Every Suggestion is welcome! Please leave a comment about anything, your feedback is Essential! Grammar corrections are welcome too, since I'm not a native speaker I could did some mistakes. I'm a formely Rom Hacker, this project started as a rom hack, but after some good reception, I asked the opinion of my suporters to develop a completly new game with a similar concept, they answered positively and I created this idea. 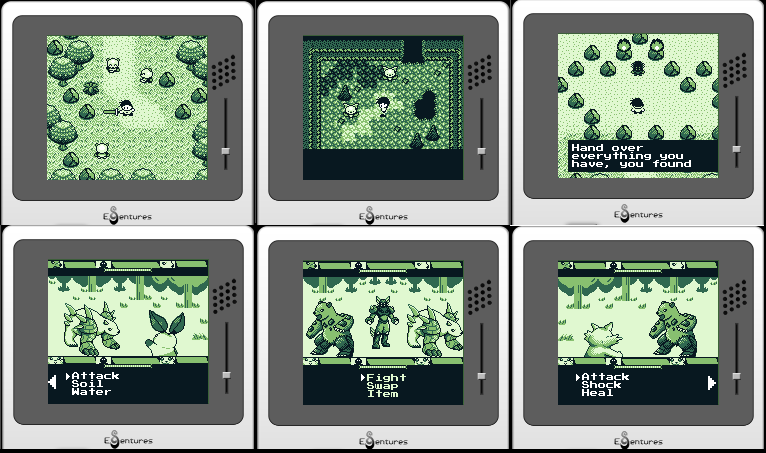 Moving to game development increased exponentialy the graphics usage, even still using the gameboy style, I can make full screen images, and no more worry anymore about flickering. Still Rom hacking helped me a lot in my life to become a GameDev, I will always love rom hacking, and I will always be grateful. January 29th, 2018 (11:45 AM). 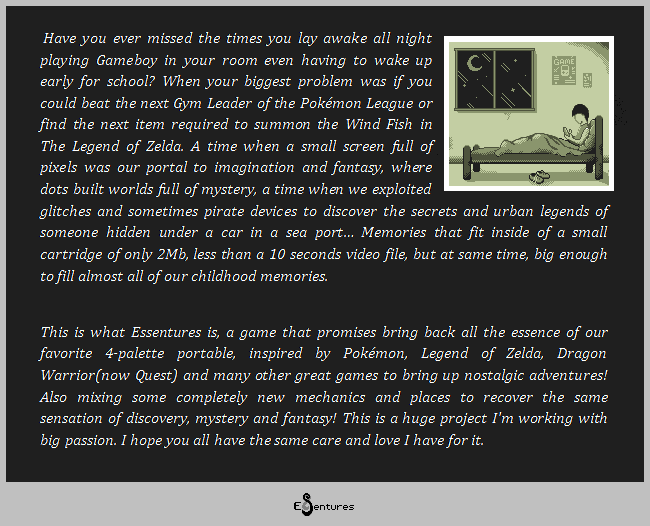 Oh my, your intro text made me cry :'), I loved the idea, its pretty original! So many features! Keep doing this great work! January 31st, 2018 (6:13 AM). This is pretty interesting~ How the battle will work? January 31st, 2018 (6:23 AM). Loving the screenshots already, Loving the whole concept as well. You are going so hard on this. I can't wait to see how this progresses. February 1st, 2018 (3:35 AM). February 5th, 2018 (11:52 AM). This is AMAZING, when will be avaliable the download? February 19th, 2018 (1:00 AM). I would love to give you a detailed explanation of the battle system and how I'm concepting it, but the battle system is still in-development, and maybe it will need many polishes before I can annouce it completly. Well making a perfect balanced battle system isn't an easy task, it takes many steps, I'm working hard to deliver a battle system without flaws or unbalanced design. A system where all Essentures can be used (even the young ones) for specified tasks, and that the objective isn't find the best combination, but instead where you can choice your own battle style and you create your own strategy. - Humans has a wide versatility of strategies, but their are less powerful than Essentures, while Essentures are more limited in their movepool and strategies but can bea lot more effective taking and giving damage. - Battles have no 'common' strategy, you can focus in many different ways to defeat opponents, ranging from brute force of one member, or a coordenated strategy of all members, whats to do its only up to you! - And lastly, there's no luck factor! This is pretty experimental, cause I never saw any other turn-based rpg without any luck factor, but I want to try this, I want to praise players that use mind, I want they know exactly why they lose and what they need to win. Games like Checkers, Chess, Go, Othello/Reversi involve no-luck and are still enjoyable. The bad part is it won't work so easy for kids, and young audience, but my plan is create a game more focused in a more mature audience, from the story elements, visual and gameplay, still the game can be enjoyed by kids in a non competitive point. Thankyou very much LyonSyonll, seeing users like you, using words like 'amazing' to describe my project is what keep me moving on, this makes me really happy ^^ I have no idea how or when I'll distribute it right now, There's a problem of time and money I have to look at after, but still I hope not last so much, it'll depend on how many people support the project. 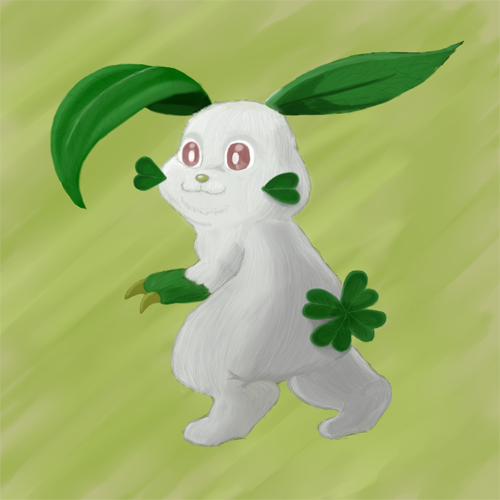 Kuniklo and its family (Fortuna) are based in concepts of luck(here, the clover and rabbit's foot), even Essentures battle mechanics having no luck factor, speed is important for a speficic technique that let's Essentures evade moves, this is why Kuniklo is a speed professional. February 22nd, 2018 (10:05 AM). I loved the nice new graphics,the artwork is fine too. 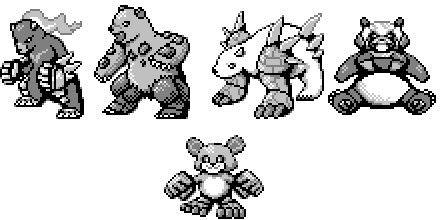 I have a question,does all monsters have 4 evolutions ? March 10th, 2018 (11:45 AM). not all, the minum for commons Essentures is 3 stages, the maximum is 6 stages (counting the 'young' stages), some special ones have just 1. March 13th, 2018 (9:57 AM). March 17th, 2018 (12:21 PM). Edited 1 Week Ago by IRON NIDOW. March 31st, 2018 (1:57 PM). Edited March 31st, 2018 by IRON NIDOW. April 10th, 2018 (4:07 PM). May 16th, 2018 (7:32 PM). Now THIS looks sleek and creative. Love it! Available on Mobile & PC Platforms! February 20th, 2019 (12:52 PM). February 22nd, 2019 (11:13 AM). I love how you use 'scientific names' for the monsters in esperanto haha! February 22nd, 2019 (12:38 PM). 4 Weeks Ago (12:00 PM). 3 Weeks Ago (7:59 AM). 3 Weeks Ago (10:42 PM). 2 Weeks Ago (10:07 AM). 5 Days Ago (9:17 AM). 5 Days Ago (3:59 PM). 5 Days Ago (8:56 PM). Whoot! I am so happy to see an update finally come out, I've been lurking around the official Facebook page now and then! I love how you've gone about the models as well! Cheers to an eventual release. 3 Days Ago (10:49 PM). Very nice ideas with nostalgia vibes all over the place! Will definitely try it out. Keep it up and I hope the final product is as good as you want it, having worked so much for it.